Use this smart approach to build your workout in a new gym, on vacation, or any time you need a break from strict programming. It can be customized for any goal! Stop me if you've heard this before: "If you're failing to plan, you're planning to fail." Look, we all know that the best way to see consistent progress in the gym is to have a set plan in place and to follow a program. You've been told that a million times. You address your weaknesses, continue to build upon your strengths, build balanced strength, and keep moving in the right direction. But there are certain times when it makes sense to think outside the box. Maybe your training feels stale, and you're tired of doing more or less the same thing over and over again. When this happens, it would be silly to ignore it. Maybe you're tired of being told what to do for each and every rep, and you want a little more room to experiment and explore. This is OK, too! I've got two plug-and-play templates that will allow you to get into the gym and have a great training session without having to fret over all the little details. I don't recommend these templates as your only program, but they'll work great as a one-day vacation, a one-week adventure, or even a one-month nonprogram program. The key to building a great workout on the fly is to ensure that it's not totally random. For example, this template provides plenty of room for interpretation, but at the same time, it covers all the major movement patterns you need for full-body muscular development and strength. Let your goals, intuition, and curiosity guide you. If there's something you've been wanting to try, give it a shot for a few weeks. Without further ado, here's your program, along with 3-4 options for each movement variation. If there's something you want to do that isn't listed but fits in the category, you can certainly sub it out. How do you know which exercise variation to choose? Let your goals, intuition, and curiosity guide you. If there's something you've been wanting to try, give it a shot for a few weeks. If you go to the gym and you can't get the equipment for one variation, try another. Be flexible, but push yourself in whatever you choose. If you've got more time on your hands and are up to the challenge of less recovery time, here's a four-day split you can use to build your workout on the fly. Supports Cognitive Function, Enhances Mood, Expands Muscle Endurance, and Helps to Delay Fatigue. Go Now! 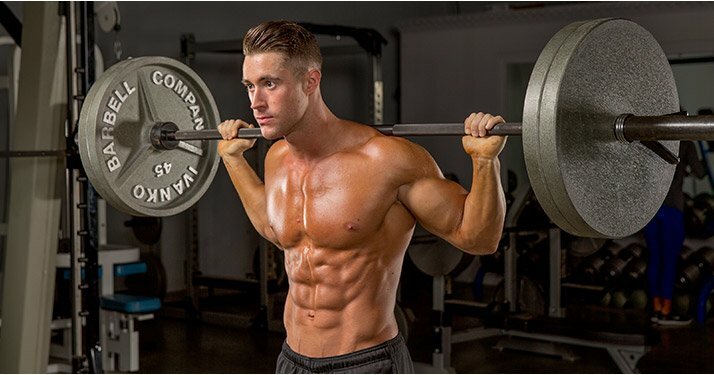 I know what you're asking now: What are the sets and reps? The great thing about this style of training is that you can adapt it to work for strength, size, or fat loss pretty easily. As long as you're clear about your goal, you can make either template work for any goal. Let's start with the bigger picture. Think of training as two ends of a spectrum. On one end, you've got more neural-focused training, which builds strength and power. On the other end, you've got more metabolic-focused training, which hammers on hypertrophy and fat-loss. Back squat: 5 sets of 5 reps, rest 3-5 min. Everything about this structure implies that you'll be moving some pretty significant weights. When you move heavy weight, you're not going to be going excessively slow (or fast) at any point during the lift, so don't worry about tempo or time under tension. Just lift and rest. Your nervous system takes far longer to recover than the muscular system does, so take ample time between sets. Address your weaknesses, continue to build upon your strengths, build balanced strength, and keep moving in the right direction. Back squat: 4 sets of 10 reps, 3010 tempo, rest 90-120 sec. The tempo there refers to the speed of the various parts of the lift. In this case, it means a three-second eccentric or lowering phase, zero seconds in the bottom, one second to rise, and no pause at the top before starting another rep. We're going to be doing more reps per set, slowing down the repetition speed (which increases total time under tension), and shortening the rest period. All of this equates to a workout that's much more metabolic in nature. Of course, it would be silly to take some of these movements—the gun show, for instance—really heavy, so don't forget to use that rarest of supplements: common sense. This approach is best suited for a lifter advanced enough to know how to perform a wide range of exercises with good form. If you're a beginner, you're probably better off with something more structured that allows you to get lots of practice at specific movements. Likewise, I don't see this style of training as being ideal for months on end. But as a way to mix things up, or just to make sure you're still getting quality training while traveling or on vacation, this approach can work wonders. Now plug, play, and enjoy!